Essential oils can be used in countless situations for countless purposes, but safety is of utmost importance. Since these oils are so potent, they can’t be used frivolously. But don’t worry, reading this post is the first step to oil safety and we’ll keep it updated regularly with information as we come across more. Topical use is any method that applies the oil directly to your skin whether through the use of a carrier oil, in another product or simply neat. When first beginning, we always recommend diluting with a carrier oil for topical application. You never know how you will react to an oil, so the safest way is to begin with a carrier oil and decrease the dilution until you’re sure the oil won’t cause a reaction. Reactions are so individual, so experiment with oils at your own discretion and shift the ratio of essential oil to carrier oil as you see fit. Also important to keep in mind, some essential oils are classified as “hot” oils (Clove, Thieves, Cinnamon Bark, etc). Always dilute hot oils with a carrier oil to help carry the oil into the skin and to prevent skin irritation/redness. HOW DO I KNOW IF AN OIL IS A “HOT” OIL? 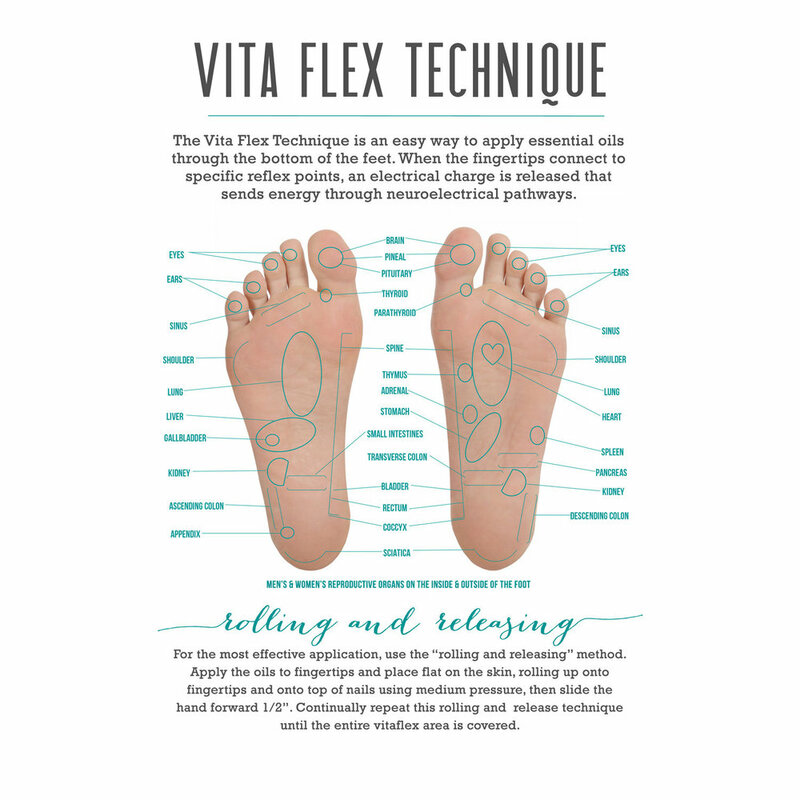 The bottoms of your feet are not only an excellent place to apply oils because of the vitaflex pressure points (see chart below) located there, but also because the skin is more tough than other areas of your body. A good rule to follow is: when in doubt, dilute! Especially with small children. we ALWAYS recommend diluting with children. While adults can handle a dilution ratio of 10-25% (30 drops – 1/3 of a 15ml bottle), children need somewhere closer to 1-3% dilution (3-9 drops in 10 ml bottle). HELP! THE OIL IS IRRITATING MY SKIN! If you apply an oil topically and it seems to be bothering you, simply take a carrier oil and apply to location on skin. Then take a towel and wipe away. DO NOT use water, as that will only drive the oil in deeper. This same routine goes if you accidentally get some oil in your eye. Use a carrier oil to remove it. All of the citrus oils are photosensitive. This means if you apply these oils before or during exposure to direct sunlight or UV rays, you may experience a rash, pigmentation, or even sunburn. If you are going to use Lemon on your face, do it at nighttime and make sure 12 hours pass before being in the sunshine. You can also wear photosensitive oils under your clothes, and ingest, with no problems. When using essential oils in your bath, you have to use a vehicle to carry the oil. This will ensure the oils will not gather on top of the water (as oil always does) but instead disperse throughout. One easy way is to take a heaping handful of Epsom salts, add several drops of your essential oil to the salt and slowly let the salt melt into the running bathwater. This could cause permanent damage to your eye and/or your ear drum. For eye issues, put a drop of essential oil in your palm, mix it around with your finger & circle around your eyes as if you are tracing glasses. You can also then cup your hand with the oil in it over the affected eye for several minutes to let the vapors do their thing. For ear issues, rub oils on the outside & all around your ears. You may also mix oils with a carrier in a small bowl, dip a cotton ball into the bowl, and place the cotton ball in your ear. Internal use is any method that gets the oils into your body whether from use of capsule, or adding oils to your food or beverage. One of the more controversial topics surrounding essential oils is their ingestion. If you’re going to ingest oils, you must be careful. First of all – we recommend never swallowing a single drop of oil unless you know where the oil came from and how pure it is. You really cannot trust what the label says (an essential oil legally only has to be 5% pure to be allowed to label itself 100% pure). This is why sourcing is so important when it comes to essential oils. Do your research before making any decisions that harm you or your family (and cause you to end up in one of those viral facebook stories). The brand we choose to use is one we trust so we personally feel confident using oils internally. HELP! MY CHILD INGESTED SOME OIL! If your child ingests an oil, have him/her drink a fatty liquid such as whole milk or almond milk, etc. to dilute the oil. A heaping spoon of any nut butter would work well too. Most oils are ok if ingested (of the brand I recommend) but please keep your oils out of reach of children, particularly those with safety caps. The essential oils will break down the bonds in the plastic, causing you to ingest icky chemicals. Always use glass or stainless steel when drinking water (or any other liquid) with essential oils. we also recommend using metal straws (which makes drinking that much more fun). Aromatic use is any method that spread the oils into the air through the use of a diffuser or a quick whiff from the bottle or your hands. If any water splashes onto your skin from the internal chamber, keep in mind it contains essential oils. In order to prevent any mishaps, stay away from open flames when you’ve been splashed. There’s a small chance anything can happen, but better safe than sorry. Essential oils can be safely used with any number of animals. We recommend you do more specific research about the animal you hope to use them with but we’ll cover some more general safety guidelines for popular pets below. Be extra careful diffusing oils containing phenols around cats. We make sure to never close my cats in a room with a diffuser. They’re always given the choice to leave the room if they don’t like the smell of the oils we have diffusing. Not to be a snobbish oil purist – but essential oils bought at the grocery store that are full of random solvents are likely to hurt you and your cat. Please use discretion and do your research before bringing something into your home and subjecting your cat to it (this goes for the candles and cleaners you fill your home with too). Dogs are much less sensitive to oils than cats but one thing we always keep in mind is to never apply oils above the collar. Dogs have a much stronger sense of smell than us and any application of oil too close to their nose is likely to drive them a little crazy. As always, experiment and start with a low percentage dilution to see what your dog likes. With baby on the way, there are guidelines and recommendations to help keep you and the little one safe. Children are sensitive to oils so be careful using them around the house. Also be sure to dilute the oil in carrier oil with no more than a 5% dilution ratio. *Information on this page has not been evaluated by the FDA and should not be used to diagnose, treat, or cure any disease. I am not taking the place of your licensed medical professional, and cannot take responsibility for your health. I encourage you to do your research on essential oils before using them for yourself and your loved ones. Please read our full disclaimer for more information.